I Know What My Supplies Mean to Me. #Insulin4All! If you’ve been reading this blog for a while now, you’ll know how strongly I feel about blood glucose monitoring and test strips. I could not possibly survive without my test strips. Sometimes I use as many as 10 a day. Test strips, among other diabetes supplies, help me to feel grounded and in control of my diabetes. I could not possibly live without them. So much so that I’ve been driven to write some pieces, both here and for Insulin Nation, advocating for greater access for people with diabetes in Australia. So when Elizabeth Rowley from an organisation called T1International reached out to me about a campaign called #Insulin4All, it seemed like a natural cause for me to support. It’s easy to take diabetes supplies for granted when I live in a country where I have always had excellent and affordable access. It’s easy to take my diabetes healthcare professionals for granted when they are so easily available, and at no cost to me under public healthcare. It’s easy to forget that these supplies, and professional support, are what keep me alive and healthy. Today, and each and every day for the rest of my life. And I couldn’t imagine my life without them. When I think about disadvantaged people in other parts of the world who cannot access insulin, among other diabetes supplies, I really have nothing to be complaining about. There are people out there with type 1 diabetes who struggle to survive because they cannot access life saving insulin, blood glucose test strips and basic healthcare. Some take insulin without knowing if their blood sugar level is high or low. Some suffer diabetes complications, or die a premature death from a lack of supplies, education and healthcare. There are plenty of really touching stories on T1International’s blog. I support #Insulin4All this November, because I know what my diabetes supplies mean to me! I hope that you will join me, and have a bit of fun with it too. 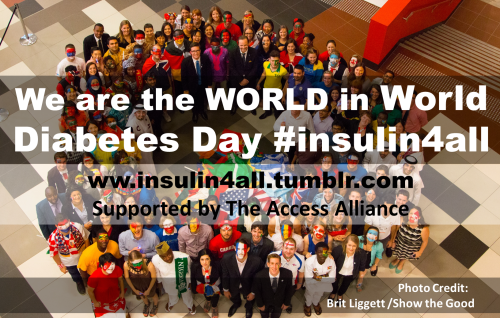 So, you need your sign, with the words “we are the world in World Diabetes Day,” and the hashtag #Insulin4All. I felt like a kid again, with my ruler, lead pencil, eraser and textas, carefully outlining my letters and words on a straight line and then marking over them! Then you need a photo, with yourself or a group holding the sign. Get creative. The best I could come up with was holding a handful of my Lantus pens. And, trying to find the best lit spot in the house free of noticeable junk in the photo! 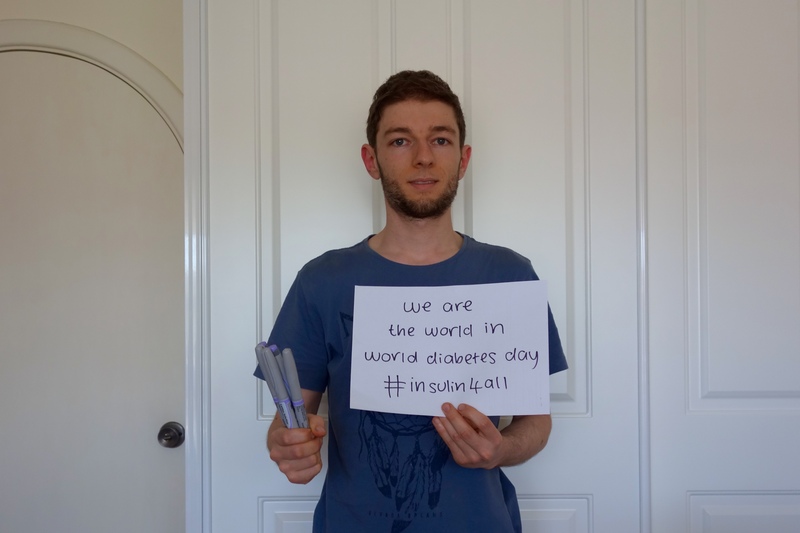 Then, head on over to insulin4all.tumblr.com and upload your photo to the campaign wall. And spread the word! #Insulin4All! I had never heard of this before. Off to take part and look up more info. With my dodgy running out of ink highlighter sign.